Diamond Rio is one of my favorite country groups. They have a wonderful, unique style and some of the best harmonies in the business. 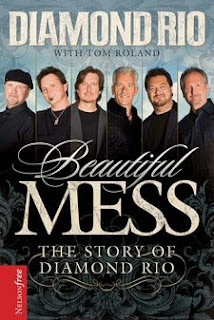 As a big fan, I was anxious to read their story in Beautiful Mess The Story of Diamond Rio. It covers the band's difficult beginnings, their rise to fame, and what happened once they made it to the top. Full of fascinating information and great personal glimpses of the men behind the band, this book takes you along with the guys as they go from unknowns to stars. I really enjoyed this book. I knew very little about the beginnings of Diamond Rio, so I found the story of how the band formed to be quite interesting. The book is written in a style that helps you be right there with them as the story unfolds. The book is informative, witty, fascinating, and at times sad. It is the story not just of the band, but of their families, their personal lives. I had no idea how many obstacles these men had to overcome while trying to make it! All in all I found it to be a fantastic read. If you are a country music fan, you will probably enjoy this book. Ramblings of a Texas Housewife Product Review and/or Giveaway Disclosure- I have received no compensation from Thomas Nelson other than the offer of free product to review and/or giveaway. Any opinions expressed on Ramblings of a Texas Housewife are my own. My reviews are never reviewed or edited in any way by sponsors. Hey Nessa! Just wanted to stop by and say hi.